Sculpture of Laocoön in the the Palace Of The Grand Masters on Rhodes, showing Laocoön and his sons Antiphantes and Thymbraeus being strangled by sea serpents. 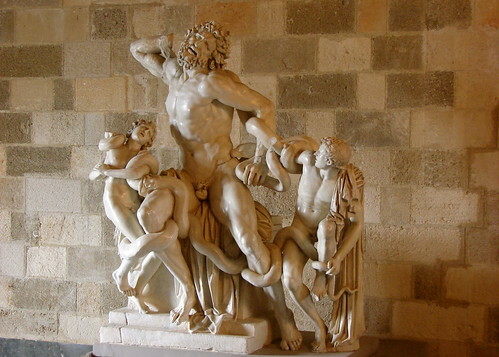 Laocoön was the son of King Priam of Troy who tried to warn his fellow Trojans against the wooden horse presented to the city by the Greeks. In the Aeneid, Virgil gives Laocoön the famous line "Equo ne credite, Teucri / Quidquid id est, timeo Danaos et dona ferentes", or "Do not trust the Horse, Trojans / Whatever it is, I fear the Greeks even bearing gifts. ", which is the source of the saying: "Beware of Greeks bearing gifts."